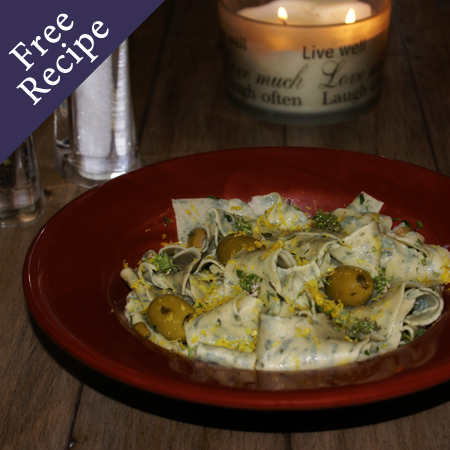 Fabulously easy, this gluten free pappardelle pasta dish is perfect to impress guests. For an extra wow factor, flavour the pasta dough with finely diced thyme. The sauce requires no cooking so you can have this served in the time it takes to cook the pasta. 1. Place a large pot of heavily salted water on to boil using a high heat. 2. Remove the thyme leaves from the stems and place in a bowl. 3. Add the lemon juice, lemon zest, oil, salt and pepper and whisk together. 4. Dice half the olives and add to the sauce. 5. When the pasta water is boiling rapidly, add the pappardelle, immediately stirring to separate. Boil uncovered until the pasta is al dente (2 – 3 minutes). 6. Drain pasta then put in the serving bowl, pour over sauce and gently toss the pasta. Sprinkle over the whole olives and serve immediately with grated parmesan if desired. 400g of shredded cooked chicken adds flavour and protein to this dish. If desired warm the chicken before adding.